ABU DHABI — Just across an expanse of sand and highway, close to this capital city’s airport, lies a collection of modern buildings promoted here as the example incarnate of what’s possible when a nation fueled by oil decides that the supply of its primary natural and economic resource is finite. It’s a beginning. But just that. A beginning. 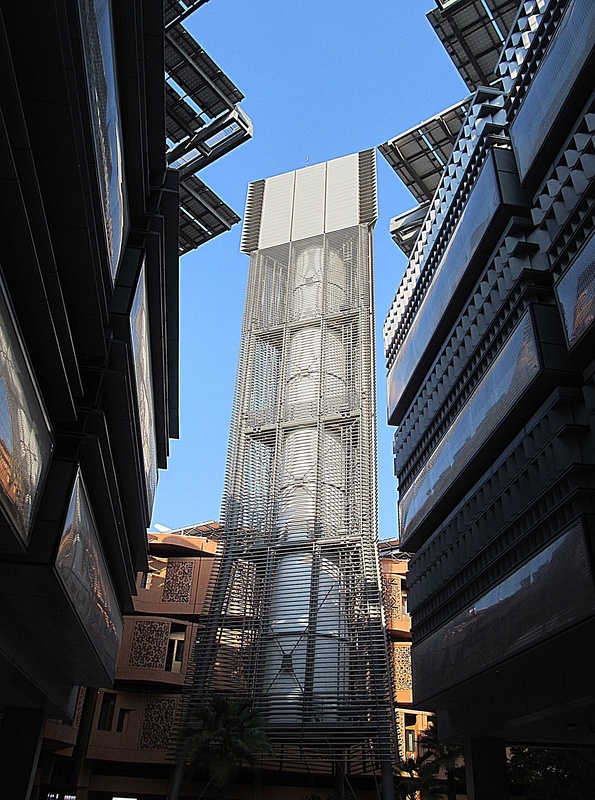 Masdar City, as it’s called, is a state-sponsored planned development that isn’t yet close to being a city. Masdar City also stretches a few other bounds of credibility in its marketing message. The collection of structures is promoted as a global showcase of sustainable innovation, a prime international laboratory of energy-efficient construction, water-saving applications, and clean energy development. But other than the big solar array at the development’s entrance it’s hard to tell whether any of those assets actually are in place. There was no sight of the transit system that is said to exist here to move people in, out, and around the development. Reported to already have attracted “thousands” of workers and residents, the day I visited the dark lobbies and empty retail spaces of the development’s buildings, as well as its shaded walkways, were largely empty. There were more people hovering about Masdar City’s marketing installation at the Abu Dhabi exhibition hall here than were visible in the actual Masdar City. 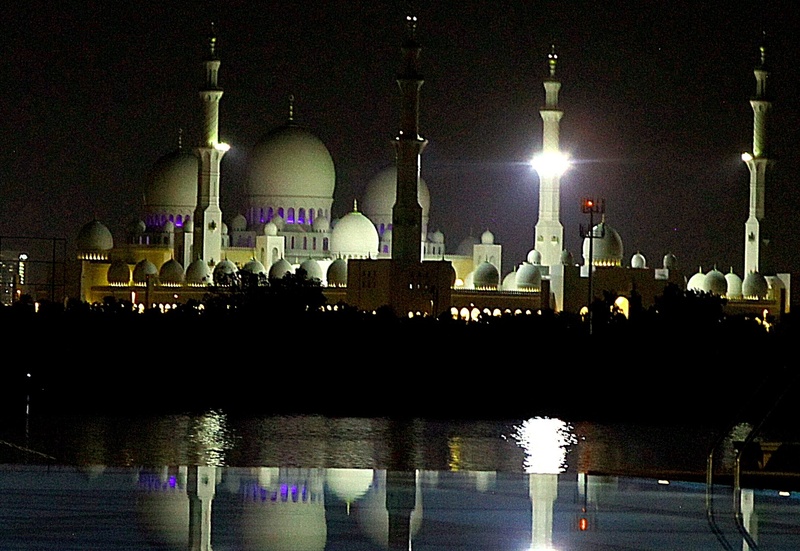 What is apparent is what Gulf nations do very well – design and construct extravagant and beautiful buildings. 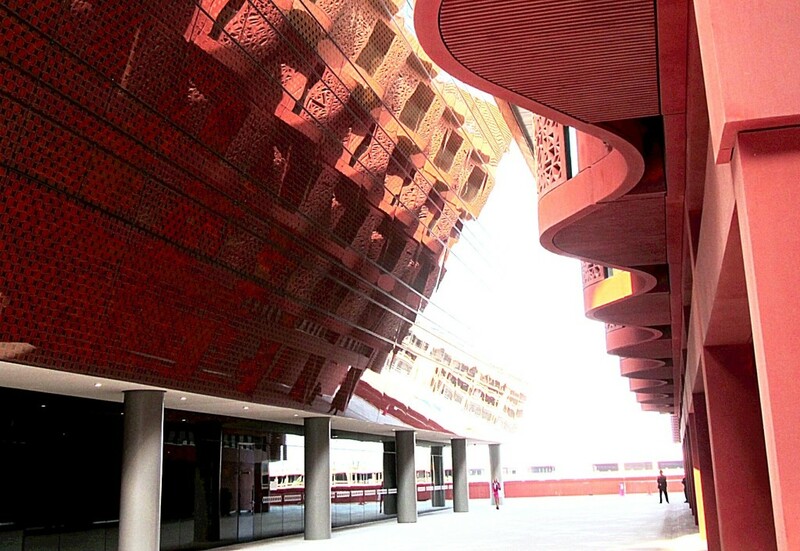 In Masdar City’s interesting architecture, pedestrian-friendly land use patterns, and its updated Arabic-design cooling system is the interest this nation and its Arabian Gulf neighbors are displaying in diversifying their economies. All of the Gulf nations are talking about and making investments in clean energy development and water conservation practices to 1) improve their standing in the world, and 2) make a sustained run at keeping their energy-stoked civilizations healthy. The latter is the real challenge — a race against time, demographic trends, petroleum-derived wealth, and climate change. This bone-dry region is getting dryer. The population is rising, both within the native resident communities and from the tens of millions of contracted migrant laborers from Nepal and China, India, the Philippines, Bengladesh, Eastern Europe, and America who are needed to make the country operate. The growing Gulf economies are sucking up more of their own domestic oil and natural gas reserves to construct and operate the domestic infrastructure, to fuel fleets of cars and planes, and to power the electric plants that keep interiors cool during the summer inferno, and to desalinate the Gulf’s salty water. It takes an ocean of fuel to keep it all running. Saudi Arabia, which desalinates more water than any other country, produces 6 million cubic meters of fresh water daily from two seas. Saudis burn oil to produce the heat and energy to convert seawater to fresh water. Saudi demand for fresh water is so large and rising so fast that desalination is one of the factors in a worrying calculation made public last year by Gulf nation researchers. Unless some factor changes in Saudi demand trends for energy, water, transportation fuels, and cooling, the world’s largest oil exporter will use so much of its own oil and production capacity to serve its own economy that by the early 2030s it ceases oil exports. American bank economists have reached the same conclusion. Frankly, that energy-water choke point is, arguably, the biggest threat to global stability. Why? Because it would, starting in the mid-to-late 2020s, cause oil prices to lurch to unaffordable prices and prompt economic collapse. Neither Saudi Arabia nor the United Arab Emirates, Qatar, Kuwait and the other Gulf nations are interested in making that scenario a reality. For good reason. Here in Abu Dhabi, and neighboring Dubai, the UAE leadership is using its liquid hydrocarbon wealth to build a civilization that gleams. New hotels sparkle in the bright sun. The new airport is immense, and so inviting little white, egg-shaped sleeping pods are scattered about to provide rest for weary travelers. The skyline, just as in Doha, is a toybox of boyish buildings shaped like bowls and bottles and sleek rockets, in a palette of colors. The roadside strips of grass and trees are uniformly green, immaculately manicured, and drip irrigated. The air is clean. The drivers of the many Lamborghinis and Ferraris and Audis whine through their high gears and speed off in a lightning shock of polished grilles and super-shined tinted windows. Just how the Gulf nation leadership will pull off the miracle of keeping this modern oasis of glass and steel functioning into the 22nd century is not all that clear. At the moment, the leadership of the United Arab Emirates is busy telling the world that solar construction is a path to generating 7 percent of the country’s electricity from renewable sources by 2020. That’s not a big number. Germany generates more than a fifth of its power from renewables, though the price of power is producing political trouble from the utility and manufacturing industries. The UAE appears serious about the sun and the wind. The UAE company developing solar here is Masdar, which is partnering with Total, a French company, and Abengoa, a Spanish company, to build a 100-megawatt concentrated solar power installation in Al Gharbia, in the country’s western region. In 2009, the country founded the International Renewable Energy Agency to foster clean energy construction here and around the world. 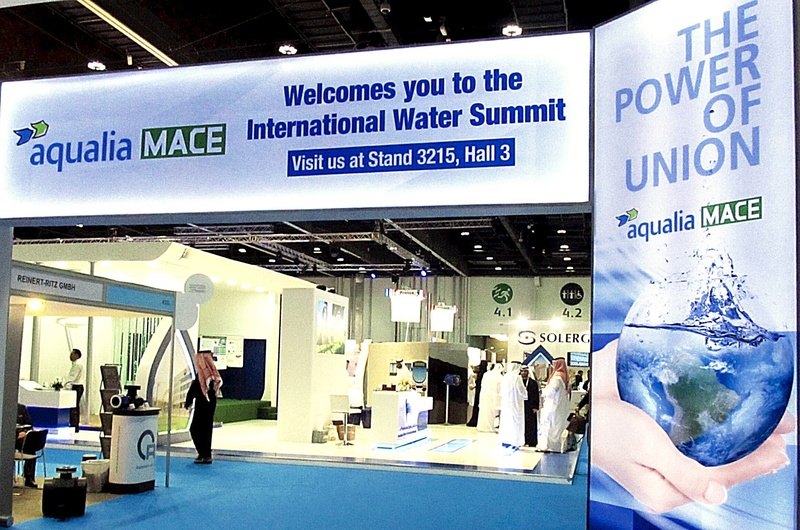 And Abu Dhabi hosts the annual World Future Energy Summit, and the two-year-old International Water Summit, both of which occur during the Abu Dhabi Sustainability Week, which began on January 18. Indeed it’s a start. An important one. Thousands of water and clean energy executives and researchers and administrators convened here to help move ideas about efficiency and conservation and best practices from the sideline to the main playing field. I am here in Abu Dhabi, a city of almost 1 million residents and capital of a nation of more than 8 million people, to serve as one of the dozens of speakers from all over the world addressing the International Water Summit. But the shift to more wind, more solar power, more serious water conservation is proceeding much more slowly than the accelerating speed and power of the Earth’s ecological transition. The UAE, with all its money, all its vision and ambition, knows that. Which is why the country is hedging its bet. Not discussed at all in either the energy or water summits is that the United Arab Emirates is constructing 5,400 megawatts of nuclear power at the moment, four separate reactors, which is, by far, the largest electrical production project underway in this desert nation. The country, located on the Arabian Gulf near the Straits of Hormuz, needs that power to cool the new buildings and to help provide the nearly 1 million cubic meters of desalinated seawater it will soon need to produce daily to keep citizens and businesses of its ultra-modern society supplied with fresh water.